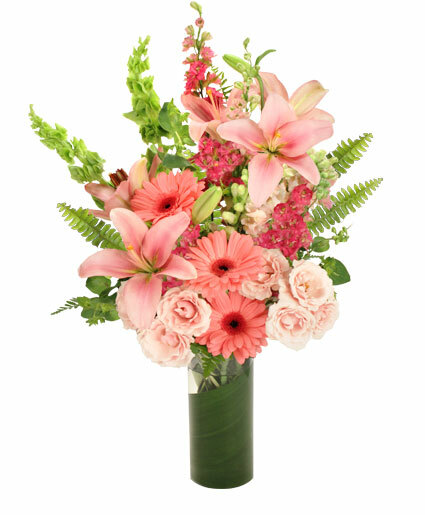 Cylinder Vase, Foliage: Aspidistra Leaf, Fern, Leather Leaf, Hot Pink Gerberas, Pink Lilies, Pink Miniature Spray Roses, Pink Larksspur, Pink Snapdragons, Bells Of Ireland, Bupleurum. Pink Optic Trumpet Vase, Green Antique Hydrangea, Dark Pink Gerberas, Ivory Roses, Pink Tulips. 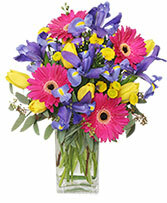 Flowers can bring a smile, give you comfort or remind you someone cares. 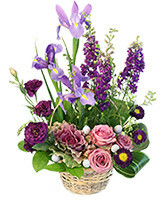 Springtime is a great time to send some to the ones you love and appreciate. 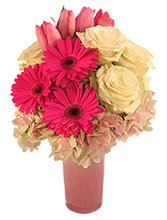 Arrangement features beautiful antique green hydrangea, pink gerberas, cream roses and pink tulips. Call cell number 7706569970 to place orders directly!